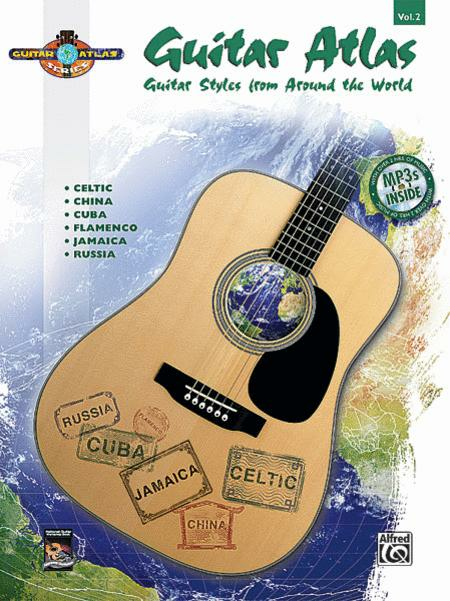 Guitar Styles from Around the World. Guitar Method or Supplement; Method/Instruction. Guitar Atlas. Multicultural; World. Book; CD. 288 pages. Alfred Music #00-33556. Published by Alfred Music (AP.33556). Discover the rich traditions, history, origins, and pioneering artists of exciting styles from around the globe. Learn the characteristic rhythms and techniques of some of the world's most remarkable music. All the music in this book is arranged for the guitar and will enlighten every guitarist---from beginners to advanced players. Volume 2 of this series features the diverse music from six distinct parts of the world. From the lively rhythms of Cuba to the exotic music of Russia, this book will give you all the tools you need to infuse your playing with a new and unique flavor. All the music is presented in standard notation and TAB. An MP3 CD, with over 3 hours of music, is included to demonstrate all the examples in the book.